It’s often said that North Beach is the last of the old, great San Francisco neighborhoods. I happen to believe that, and consider it a privilege to live and do business here. It’s the pace of life here, the sense of interconnectedness with your neighbors, of being part of a real community. As much as our architecture, bay views and picturesque streets, these are the things that make North Beach the neighborhood that it is. We were recently reminded of just how fortunate we are to be here. 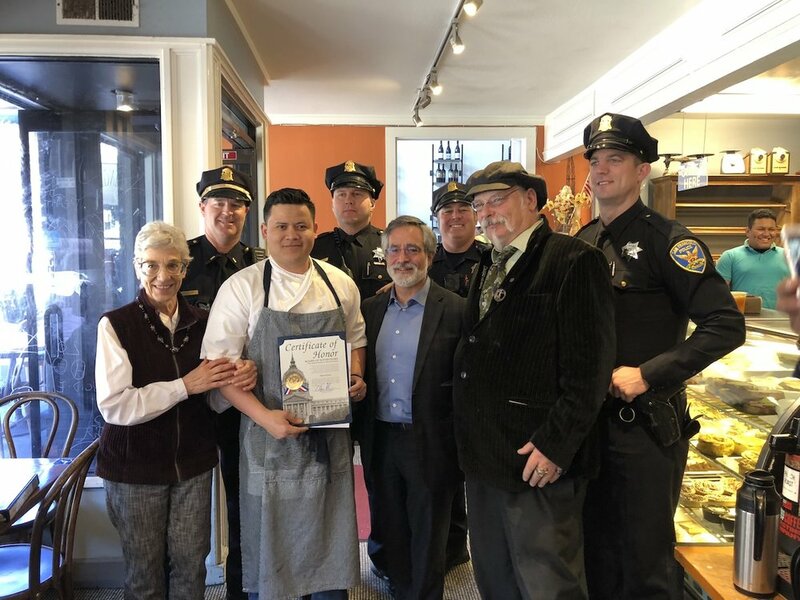 This weekend, Edson Garcia, the owner of Brioche Bakery and Café on Columbus Avenue, was honored by Supervisor Aaron Peskin and the North Beach Business Association for a remarkable act of courage. While working at his café, Garcia witnessed a man stealing an elderly woman’s purse, and sprang into action. He chased the thief into the street, tackling him in the middle of busy Columbus Avenue. Within seconds, several patrons from Mr. Bing’s across the street joined the fracas, restraining the perpetrator until the police arrived. Happily, arresting officers Ryan Elrod and Zack McAuliffe demonstrated lightning-fast response time, arriving barely more than two minutes later. It’s truly gratifying to see such a selfless display of bravery and civic solidarity. As Supervisor Peskin put it, this is one of those instances in which “everyone did everything right.” The vigilant Garcia was given an official commendation from the city’s Board of Supervisors, presented by Peskin himself. At the same ceremony, held at Brioche on Friday, Garcia was also given a commendation letter from the SFNBBA–along with a free one-year membership to the association. We also want to remind our readers that we have a serious milestone coming up in the neighborhood: on Friday, October 5th, Macchiarini Creative Design of Grant Avenue celebrates its seventieth birthday–and you’re invited! A North Beach staple, the iconic North Beach gallery and creative studio has been operating on the upper end of Grant since 1948. Billing itself as the oldest continuously operating design house, production studio and gallery for modernist metal arts in the country, it is a true family business that has spanned three generations. Founder Peter Macchiarini passed away in 2001; since then, the studio has been operated by his son Dan Macchiarini and granddaughter Emma Macchiarini. Together they’ve kept the iconic business thriving; they opened an onsite jewelry crafting school in 2015. There’s an awful lot to celebrate, and this is going to be a night to remember. Festivities will be kicking off at the gallery promptly at 6:00 pm, and there will be music and poetry along with plenty of good food and wine. Be sure to mark your calendar for this one–and we’ll see you there!